Description: Located just off Highway 321 five miles north of Lincolnton and easily accessible from Highway 16, Glen Oaks is a well-established, semi-private course that opened for play in 1967. The Management and Membership take great pride in landscaping, manicuring and maintaining some of the finest fairways, bunkers and greens to be found in the area. 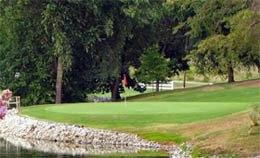 The course features a challenging and interesting layout with some severe doglegs and carries over water on 7 holes. Notes: Claims to have the best junior golf program in the area. It begins in April with an 8-week instruction course and runs thru the summer with matches at Glen Oaks and other courses in the Catawba Valley. B-Man's Take: I haven't played Glen Oaks yet, but due to regular rave reviews from other players, it's high on my must-play list.